The Calgary Stampeder Alumni Charitable Foundation was established in 1997 by then owner, Sig Gutsche as the charitable fund raising arm of the Calgary Stampeder Football Club and the Calgary Stampeder Alumni Association. In 2003, the Calgary Stampeder Football Club granted the Calgary Stampeder Alumni Association full autonomy to manage and maintain the Calgary Stampeder Alumni Charitable Foundation. 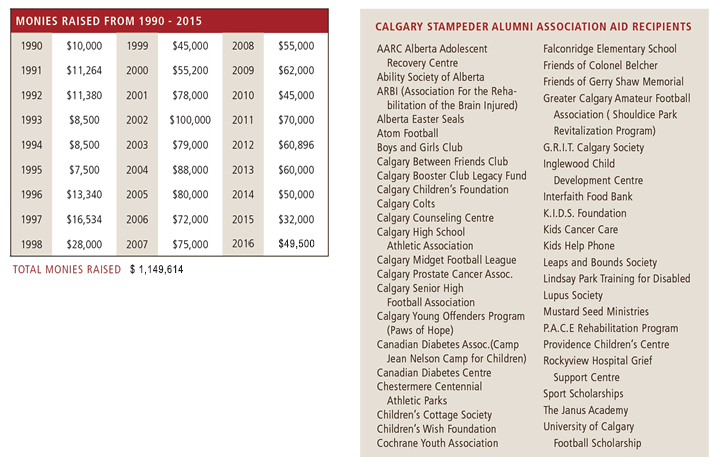 The Calgary Stampeder Alumni Charitable Foundation is a stand-alone entity administered by the Calgary Foundation, a longstanding community foundation with a city wide perspective. A portion of the interest earned annually is available for investment back into the community. The principal is "locked in". Applicable taxes become due when and if monies are withdrawn from the principal amount. To provide a vehicle which will enable the Calgary Stampeder Alumni Association, through the Calgary Stampeder Alumni Charitable Foundation, to financially give back to the community in perpetuity. To create and maintain a strong and sustainable charitable organization, serving the existing and emerging needs of the community, as they apply to minor football funding as well as other youth-based charities, or individuals, on a one off basis. The Board of Directors of The Calgary Stampeder Alumni Charitable Foundation shall consist of a chairperson and three (3) members of the Calgary Stampeder Alumni Association, an executive from the Calgary Stampeder Football Club, an active player from the Calgary Stampeder Football Club, and a member from the community at large. These are unpaid volunteer positions. It is their duty and responsibility to allocate the funds on an annual basis. The Board of Directors shall distribute eighty percent (80%) of the annual earnings toward minor football programs in Calgary & Area. Twenty percent (20%) of the earnings will go to other youth based or individual charities (including but not limited to those with a focus on sports, education, health and community service) on an as requested basis. The Board of Directors shall meet once a year to allocate funds. Grants are distributed annually during the month of May.